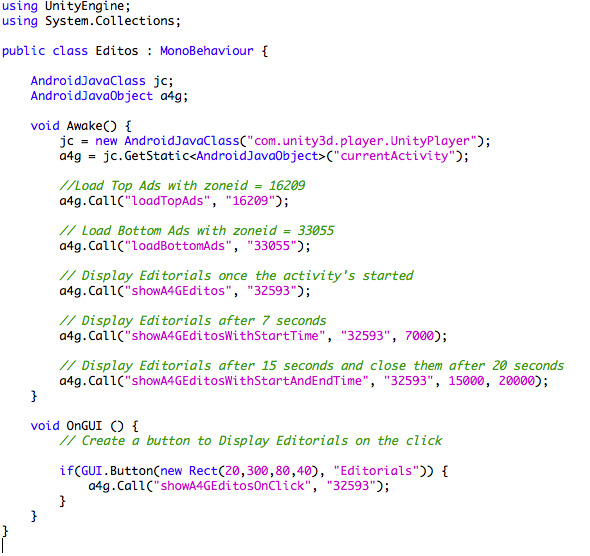 The new Android SDK v4.0 for Unity allows you handling ads events. Download the [Android SDKv4.0 publishers for Unity]. Decompress the zip file and extract the files to your development computer. The Android SDK for Unity is provided as three java JAR files (AndroidSDKPublisher4.0.jar, a4gpublisherunity.jar et et google-play-services.jar), making it easy to include in your Android project. - Create a ‘Plugins’ folder and within this create another folder called ‘Android’ (Assets­>Plugins­>Android). 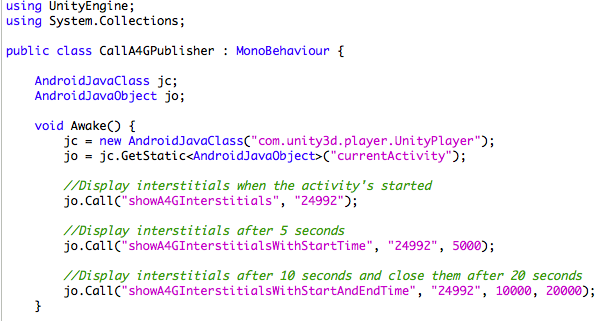 - Copy the AndroidSDKPublisher4.0.jar, a4gpublisherunity.jar and the google-play-services.jar into this folder. - Create a ‘res’ folder and within this create another folder called ‘values’ (Assets­>Plugins­>Android­>res­>values). Copy the version.xml to this folder. 2- showA4GInterstitialsWithStartTime : If you want to display the interstitials after certain time. 3- showA4GInterstitialsWithStartAndEndTime : If you want to display the interstitials after certain time and close them automatically after certain time. Download the [Android SDKv2.0 advertisers for Unity]. Decompress the zip file and extract the files to your development computer. 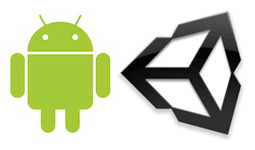 The Android SDK for Unity is provided as three java JAR files (AndroidSDKTracker2.0.jar , A4GTrackerUnity.jar et google­_play­_services.jar), making it easy to include in your Unity project. - Create a ‘Plugins’ folder and within this create another folder called ‘Android’ (Assets­>Plugins­>Android). Copy the AndroidSDKTracker2.0.jar, A4GTrackerUnity.jar and the google-play-services.jar into this folder. - Build the project for Android and then go into the ‘Temp\StagingArea’ folder with your project folder and copy the AndroidManifest.xml file into the ‘Android’ folder. 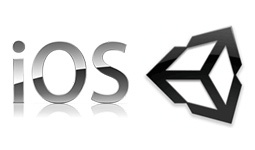 Download the [iOS SDKv3.0 publishers for Unity]. Decompress the zip file and extract the files to your development computer. – Instantiate an object of A4GInterstitials. * showA4GInterstitials method, to display directly the Interstitials when the app started. * showA4GInterstitialsWithStartTime method, to display the Interstitials after a certain time. * showA4GInterstitialsWithStartAndEndTime method, to display the Interstitials after a certain time, and close them automatically after a certain time. [a4gInter showA4GInterstitials]; // Show Interstitials when the app started. [a4gInter showA4GInterstitialsWithStartTime : 10]; // Show Interstitials after 10 seconds. [a4gInter showA4GInterstitialsWithStartAndEndTime : 10 withArg2 : 20]; // Show Interstitials after 10 seconds and close them automatically after 20 seconds. This page was last modified on 21 October 2014, at 12:48. This page has been accessed 783,936 times.